Accuplacer is a comprehensive exam given to some prospective college students for the purposes of helping colleges and universities properly place them. The Accuplacer is an untimed, multiple choice test which is taken on a computer, and consists of three question sections-reading comprehension, sentence skills, and math. Some students will also be asked to write an essay, depending on the college’s wishes. Most people complete the Accuplacer test in 60-90 minutes. The test is also an adaptive test, which means the questions you are asked will depend on your success in answering previous questions. Right answers, evidence of basic mastery, will lead to more difficult questions in order to establish knowledge level. This means that no two students will take the very same Accuplacer test. Under the reading comprehension section, you’ll read a paragraph, and then be asked a question about it, and asked to pick the correct answer from four choices. This is used to test your ability to understand and grasp written materials. For the sentence skills, the computer will display a written sentence. On the part of this portion that tests grammar, some of the time the sentence will be written incorrectly, sometimes correctly. You’ll be asked to pick the best phrasing for the sentence, from choices A-D, with A being your choice if you believe the sentence is correct as it appears. In other questions, you’ll be asked to re-arrange portions of sentences according to specific instructions, again choosing the best answer from four options. This tests your knowledge of proper sentence construction. The Accuplacer math portion is also multiple choice, and the problems will range from high school level mathematics to college level algebra. After taking the test, you’ll be told how to get your scores which you’ll receive from your college. It’s important to do as well as you can on the Accuplacer test, as it determines your placement in college classes, and can save you considerable amounts of time, boredom, and money. 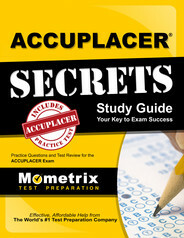 How to pass the Accuplacer – Quickest ACCUPLACER Test Prep Tips! 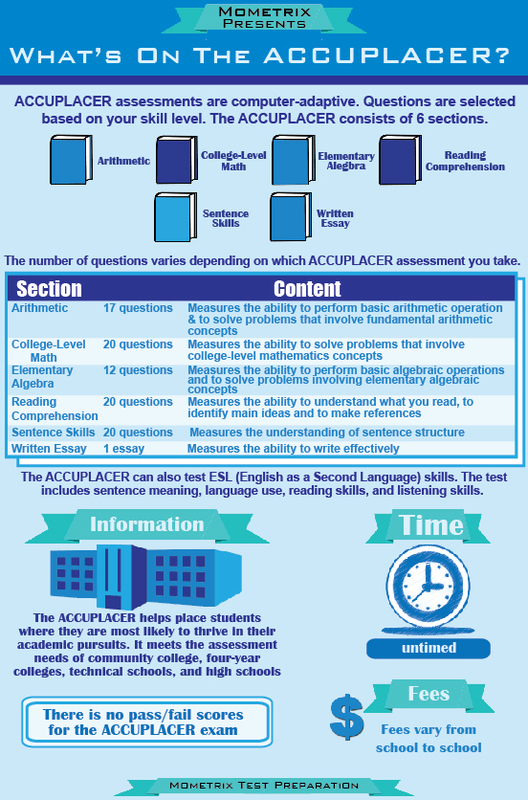 Ace the Accuplacer test using our Accuplacer exam study guide with practice questions. 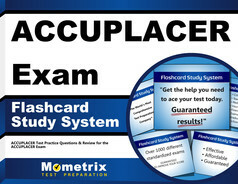 Quickly Solve Difficult Accuplacer Test Questions with the Accuplacer Flashcard Study System.